Opposition leader Mir Hossein Musavi waves to supporters during a rally in Tehran just three days after the disputed 2009 vote. He has been accused of weak, indecisive leadership of Iran's political opposition and of harboring a naive sentimental loyalty to a political system that has brutally suppressed his followers. But now supporters of Mir Hossein Musavi believe he may at last have crossed the Rubicon from loyal but critical insider to outright opponent of the Islamic regime after a year of hesitancy, ambiguity, and equivocation. The evidence is mixed and not entirely convincing. At best, Musavi -- still extolling the virtues of the Islamic Revolution and its spiritual leader, the late Ayatollah Ruhollah Khomeini -- may have made the momentous journey, if at all, by nervous tiptoe rather than a decisive march. But backers are hailing his latest statement, issued as a "Covenant of the Green Movement" on June 15, as heralding his most defiant critique yet of the stewardship of Ayatollah Ali Khamenei, Iran's supreme leader, and a break with a previously unshakable attachment to the Islamic republic. The statement, the latest in a string Musavi has released since last June's disputed presidential election, denounces the current system of vetting election candidates, calls for the independence of "religious institutions and clergymen from the state," and raises the possibility of changing the constitution "through a process of negotiation and dialogue." It also demands "fair trials" for those who authorized the alleged fraud in the 2009 poll and the human rights abuses that followed. Exiled opposition supporters have interpreted the statement as a demand for a secular system to replace Iran's current governing velayat-e faqih blueprint, drawn up by Khomeini to guarantee rule by an Islamic jurisprudent, as defined by the position of supreme leader. That claim is dismissed as wishful thinking by Musavi's critics, who point out that he continues to profess loyalty to the Islamic constitution and the "magnificent Islamic Revolution." 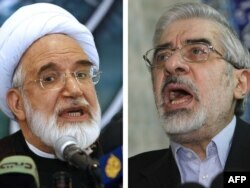 But even observers skeptical of Musavi's willingness to harmonize his stances with the popular demands of the wider Green Movement say his latest statement -- and a separate pronouncement from fellow opposition leader Mehdi Karrubi that directly criticizes Khamenei -- represent a sea change. Mehdi Khalaji, senior fellow at the Washington Institute for Near East Policy, says the two opposition figures have undergone transformations during the brutal crackdown of the last 12 months that has led them to advocate regime change. "What Musavi wants, even though he doesn't mention velayat-e faqih specifically, is a very big change. They don't [use the phrase] regime change, but what they want would not happen without some sort of regime change," Khalaji says. "What they want is to neutralize the Revolutionary Guard and Basij and prevent them from intervention in political and economic affairs. What they want is a big restriction on the authority of the supreme leader. What they want is the empowerment of political institutions. This would not happen without a big change in the political system." Musavi and Karrubi have long depicted themselves as at odds with secularist, anti-regime sentiments expressed in opposition chants such as "freedom, independence, Iranian republic" -- a variation on a slogan from the 1979 revolution that called for an Islamic republic. But Mohsen Sazegara, a founding member of the Islamic Revolutionary Guards Corps (IRGC) now running the Research Institute for Contemporary Iran in Washington, believes Musavi's views have altered over the past year due to exposure to a younger generation of followers advocating democracy and engagement with globalization. "There is no doubt that Mr. Musavi, during the past one year, has been changed -- gradually he has changed some of his ideas," Sazegara says. "For instance, in the sense of changing the constitution of the country, freedom, pluralism, recognition of different groups, different ideas, including non-Muslims and ethnic groups of Iran." Yet despite these assessments, the expressions of radicalism in Musavi's statement -- issued after consultation with other Green Movement figures -- remains qualified and carefully hedged. Khomeini is described reverentially as "that great old wise man." Meanwhile, religion remains central. Just as the Green Movement's principles "oppose the use of religion as an instrument," they also "maintain the continuous and important role of religion in our society." Seeing itself as the "purifier" of the Islamic republic's course after the revolution, Musavi pledges that the movement "will focus its energies on the framework of the constitution and respect for people's votes and opinions." While describing the constitution as "not eternal and unchangeable," the document also defines the movement's fundamental strategy as "implementing the constitution with no negligence." The opposition will pursue the goals and ideals of the Islamic Revolution while "taking a critical approach to the developments that have taken place since." Lingering doubts about Musavi's attitudes on internal politics go side-by-side with nagging questions over his policies on international affairs, particularly Iran's nuclear program -- which the West suspects is a front for an atomic bomb-making capability. Western policy makers have privately voiced concern that they do not know how a Musavi government might approach the issue. Although Musavi has previously expressed support for Iran's right to nuclear energy, his latest statement makes no mention of the subject, merely stressing the protection of the country's "independence" and voicing opposition to "involvement with foreign forces." Defenders of Musavi say his domestic political situation precludes him from taking a clear view on the nuclear program. "For Khamenei and Musavi both, the nuclear program is seen through the lens of the internal conflict," says Khalaji. "They both view it as a means to use against each other. So we cannot know Musavi's real opinion on the nuclear program until he wins and comes to power. 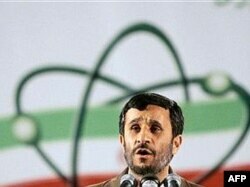 As long as he is in opposition, the nuclear program is not a priority for him." 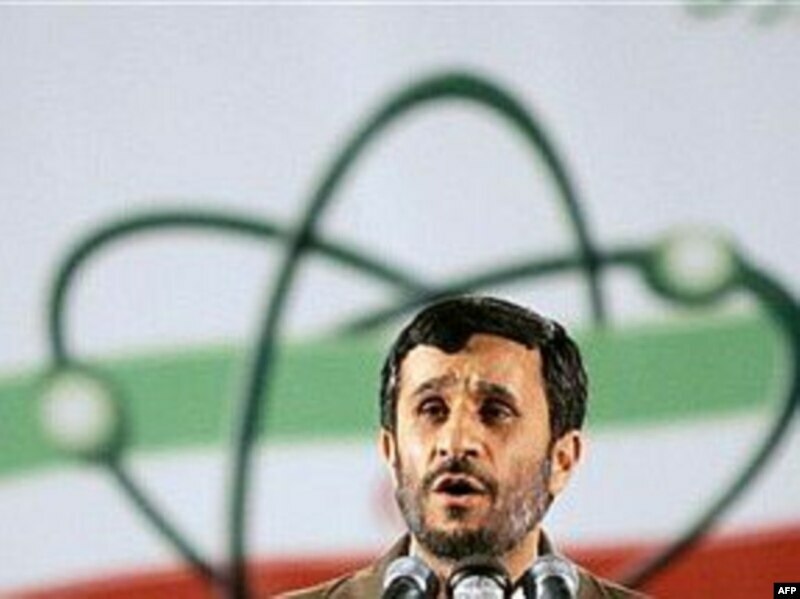 It's unclear whether a Musavi administration would pursue a different nuclear policy from the current leadership, including of President Mahmud Ahmadinejad. But Musavi's propensity for parsed statements has prompted skeptics to accuse exiled supporters of endowing his words with their own spin. Mehrdad Khonsari, an opposition activist and senior researcher with the Center for Arab and Iranian Studies in London, doubts whether Musavi would pursue a different nuclear policy from that of the current regime. He also says oppositionists abroad are exaggerating "vague" statements from Musavi as a pledge to hold a referendum on wholesale constitutional change. "Supporters of Mr. Musavi try to convey this notion that what Mr. Musavi is advocating is a secular agenda, but I don't think he's doing it in that manner," Khonsari argues. "Obviously he understands that the most important feeling in the country among ordinary people, and particularly the youth, is the drive toward secularism. Now Mr. Musavi is cautiously trying to hint that the agenda he is advocating is one that insinuates some sort of a secular agenda, but I don't think he has done it in explicit terms. He has, on the other hand, been quite explicit about retaining the Islamic constitution." Flynt and Hillary Mann Leverett, Iran Initiative directors at the New America Foundation in Washington, are blunter still. They suggest that far from being a radical departure, Musavi's latest statement simply crystallizes the continuing split between his "reformist" tendencies and the "counterrevolutionary" current of the Green Movement's more radical elements. In a "Monthly Review" commentary comparing the latest declaration with a previous, ostensibly more conciliatory statement issued in January, the Leveretts -- who have accused Western policy makers of investing too much credibility in the Green Movement -- argue: "Musavi...spends far more words in the June 15 statement than in his January 1 statement defending his loyalty (and the loyalty of those in the Green Movement) to the legacy of Imam Khomeini, the Iranian revolution and the Islamic republic. Musavi (does not) make any statement that remotely suggests he wants to do away with the Islamic Republic -- he remains a 'reformist,' not a 'counter-revolutionary.'" But Khalaji, who has previously described Musavi's fidelity to the Islamic Revolution's ideology as "naive," suggests focusing on such language misses the point. In their continued oaths of loyalty, Musavi and Karrubi are cloaking a fundamental change in their outlook. "What Karrubi and Musavi want is to keep the name of the Islamic republic but fundamentally change the content of it," Khalaji declares. "So Khamenei is right, because Khamenei says these people are hypocrites. They pretend that they are reformists but actually they are revolutionaries and that's true, they want to revolutionize the content of the Islamic republic." For all the continued emphasis on religion, the end result would be secular. "Democracy in Iran cannot but be secular," says Khalaji. "Even though religious people are taking part in this movement, the nature of the movement is secular, the demands are secular. It doesn't matter who participates, maybe some clerics participate in this movement -- [former President Mohammad] Khatami and Karrubi, they are clerics. Equality between men and women is a secular demand. It's not Islamic. Equality between citizens -- it's a secular demand. The removal of discrimination against different religious and ethnic minorities is a secular demand." What Makes Iran's Green Movement So Difficult To Read? Iran's Green Movement In The Doldrums?